Perched on a .25 acre knoll sits this adorable 2 bedroom , 2 bath , cottage style home. Beautiful distant Berkshire Mountain views from the side yard. Home offers open concept, first floor living space with many details including custom built ins and dining room fireplace and finished basement. Located behind the house is a 2-story barn with 2 garage bays - both equipped with automatic door openers. First floor entertaining space / sun room with fireplace and pizza oven. The second floor of this barn would be a great place for a studio or work shop. Call today for your exclusive showing! This 1880 Colonial has much to offer. Nice sized kitchen and dining room with hardwood floors. First floor stackable laundry adjacent to kitchen Breakfast bar, .Great sized bedrooms with large closets. 1.5 baths. Back porch /mud room.small deck and terraced yard with stone walls. Corner lot with 3 deeded parking spots. 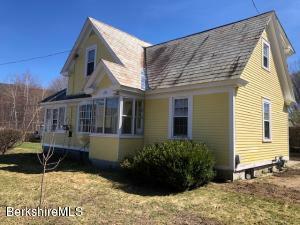 Slate roof and vinyl siding.Appliances negotiable.